Alien inspired makeup is everywhere these days. From bold multi-colored lips to strong eyes— this season is no time to be shy. And… it’s a lot easier than you think to duplicate those extra large eyes and candy colored lips. It was not too long ago that words like “alienesque” and “clownish” connoted silvery-skin undertones and a lip-smacking drip of red paint splattered all over the mouth. Now, however, alienesque means the highest of haute couture and clownish means, “Honey, you have a-r-r-i-v-e-d!” Thanks to “mega-mega-mega” stars Kokiko and Jillie-B, those sisters from Hinyo planet, we can all learn a thing or two about being proud of our uniqueness. Now that Kokiko and Jillie-B have their own make-up line out (K-J-B Color Box)–all we have to do is connect the dots and, voila–we too can have the look! What could be simpler? When asked what the inspiration for this season’s color palette was, Kokiko explains, “My mother’s sautéed corn. All of our 6 foundation shades are derived from mom’s favorite recipes. For the lips–we were inspired by mom’s frosting! Mother prefers candy pink, but we’ve added a few other pastels for contrast.” Jillie-B emphasizes that, “It is ok, ladies, to wear stripes on your lips!” As an added bonus, K-J-B Color Box has 5 of their mom’s favorite recipes on the back of each K-J-B Color Box product. Thanks to Kokiko and Jillie-B, we can now look and even cook like aliens too! Heat butter and olive oil in large skillet. Add shallot, garlic and a dash of salt. Stir frequently on low heat until tender, about 2-3 minutes. Increase heat to medium-high. 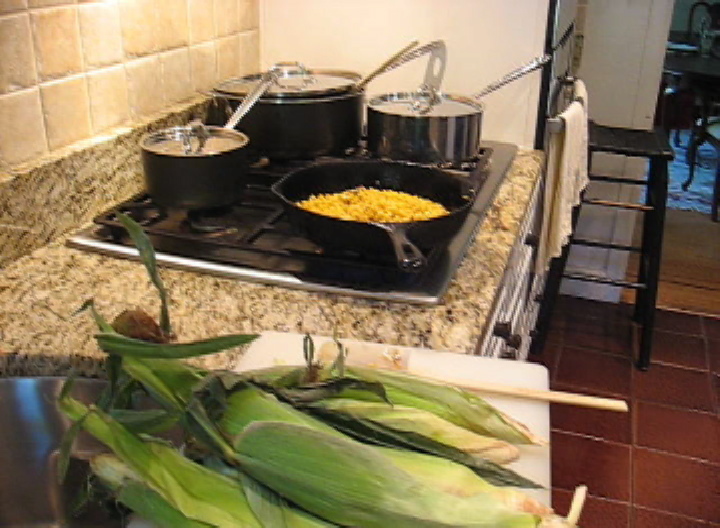 Add fresh corn kernels and cook, stirring often, until tender and nicely browned, about 5 minutes or more. Season to taste with salt and pepper. Serve. UFO COOKBOOK “KJB COLOR BOX/ Alien inspired” episode from Akuokuo Vallis on Vimeo.